Recall that since we are adopting Dummett's (1980) Type B ordering, the next card in sequence is the Justice card, numbered 20. 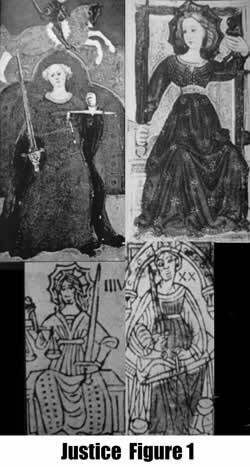 The four images that are extant from the 15/16th century are shown in Fig. 1. 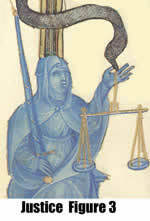 The images show the typical representation of Justice as a seated woman with scales and sword. In two cases, she is crowned and in the other two she is shown with a halo. In one image, there is a black-armored man on a white horse with a sword. 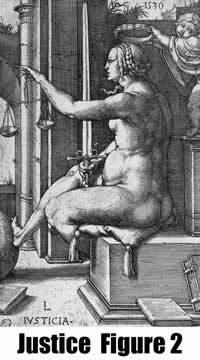 The representation of the abstract concept of Justice as a seated woman with scales and sword was well-established in religious artistic traditions. Within this artistic tradition there are many variations. Consider, for example, Fig. 2 which shows a 16th century engraving by van Leyden. Early images of Justice from the 9th and 12th century usually show a standing, haloed woman holding scales but no sword (Katzenellenbogen 1939, Figs. 32 and 33). Another interesting variation from 1499 shows Justice with the radiant face of the Sun (Shrimplin 2000, p 151). This variation suggests a potential association of the symbol of Justice (card 20) and the Sun symbol (card 18). The more typical symbol is shown in Figure 3 from a manuscript illustration ~1412. 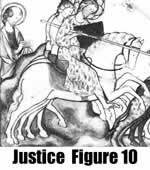 Another typical image of Justice from ~1306 can be found in the Arena Chapel in Padua (Edgerton 1985, p. 127). A 1337-1340 fresco at the Palazzo Publico in Siena (Yates 1966, Fig. 2). shows two images of Justice (Edgerton 1985). In one image, she holds only the scale and represents the just distribution of goods in a well-governed city. At the other end of the fresco Justice appears again, this time without the scale and holding the sword. In this second image, she represents vindictive justice, i.e., punishment of crimes in good government. In this image, Justice occupies a central place, crowned and enthroned. But to her right stands St. Michael also with scales and sword. We will return to other examples of Michael as Justice under the Apocalyptic Tradition below. Justice does not enter into the scenarios presented in Petrarch poem. The icon of the virtue does not appear in the artistic tradition either. I am aware of only a single exception: a 15th century Italian painted plate on which the Triumph of Chastity is represented as Justice. The image (Carnicelli 1971, fig. 6) shows the typical image of a seated woman with sword and scales atop the chariot. 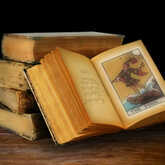 This unusual representation departs from the common imagery and is unlikely to have influenced the Tarot designs. In addition, the elaborate plate is unlikely to have been known to the ordinary card-player. Apocalypse 19:11 - "And I saw the heavens opened; and behold, a white horse and he that sat thereupon, called Faithful and True; and in righteousness he doth judge and make war." This verse is the basis of the Justice/Michael image in the apocalyptic tradition. 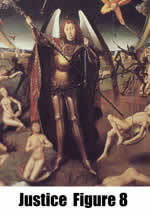 The typical image of St. Michael at the Last Judgement (e.g., Fig. 5, 13th century) shows him weighing souls and arguing with the Devil. 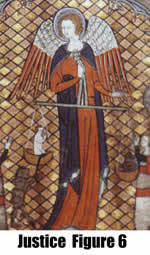 The image is of an angel, standing and winged, rather than a seated woman. It is not just that the Justice symbol of a seated woman is older and later evolved into the standing angel representing St. Michael. Bas reliefs of Michael with sword and scales date back to ~1130 and ~1250 (Link 1995, pp. 120 and 133). 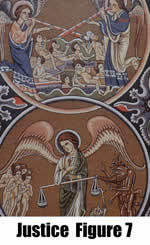 The imagery of the Last Judgment in general, and St. Michael in particular (Fig. 6) was largely fixed by the 14th century. Other examples can be found in Voelkle and L'Engle (1998, p 116), Ferguson (1954, fig. 61) and Grubb (1997, p. 107). What is of particular interest is the almost universal association of the Michael image (card 20) with the image of the resurrection of the body (card 19) as seen in Figure 7 from a 13th century Psalter. The same blending of these two themes can be seen in Figure 8 (~1470) and Figure 9 (1445-1448). An additional example by Mino da Fiesole can be found on the web at www.kfki.hu/~arthp/html/m/mino/. It is also interesting to note a woodcut image (Hind 1935, p. 103) of St Michael with sword and scales from the 15th century. 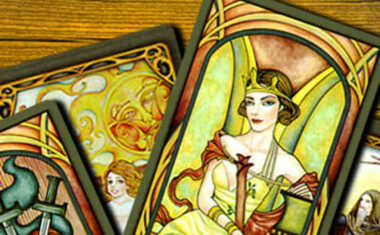 The woodcut is hand or stencil colored and looks very much like a card. It is likely that the woodcut image was produced as a 'holy card'. The iconology of weighing the soul is, of course, very old. The imagery traces back at least to the Egyptian Book of the Dead where the god Anubis is seen weighing the soul of the deceased against Maat (i.e., a feather) (Budge 1920). So perhaps we should not be surprised to find the abstract image of the virtue Justice as a seated and crowned woman mixed with the concept of the Warrior Archangel Michael who makes war against the devil (Figure 10 ) and weighs souls. Perhaps the complex imagery on the Viscounti-Sforza card merely shows seated Justice in the foreground with the image of the warrior Michael in the background. Michael is often shown in black armor (Palmer 1992) as he is depicted on the Viscounti-Sforza card. A similar juxtaposition is found in the 1421 painting by Jacobello del Fiore in the Gallerie dell'Academia in Venice. 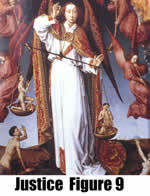 The painting shows Michael standing next to the seated image of Justice both Michael and Justice hold both scales and sword. 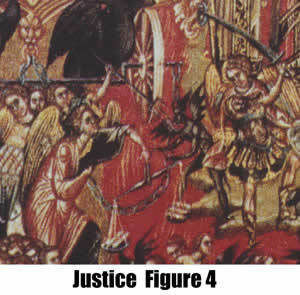 The images on the early Tarot Justice match both the typical image of the virtue Justice and also the image of Michael. It seems reasonable to conclude that the card-player would have seen the virtue Justice and/or the archangel Michael weighing souls at the Last Judgment. It is likely that the image on the Justice card would have elicited the same mixed feelings of hope/fear as we saw with the Angel card. The resurrection and judgment being two parts of the same escatological concept. By the fifteenth century, the imagery of Michael as executing the final judgment would have been more accessible to the ordinary card-player. But it remains true that the images in the early Tarot cards show Justice (woman enthroned) without wings and seated rather than standing. Nevertheless, the familiarity of the card-player with representations of Justice as Michael and the preoccupation with the last judgment would have led to an association of the Justice card with the expected "Last Times".